Are you a business owner in Sydney? Promote your business 365 days a year with the #1 Guide to Sydney. 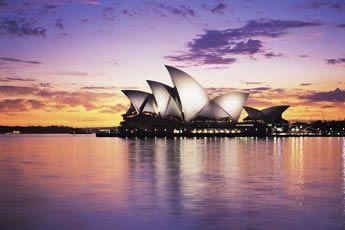 Sydney Opera House is without doubt one of the 20th century's great architectural masterpieces. In 1947 Sydney Symphony Orchestra conductor Eugene Goossens suggested that the city should have an opera house. An international contest to design the building was won by Danish architect Joern Utzon. Rumour has it that his radical design was thrown out, but an American judge, arriving late, plucked Utzon's plan from the rejected pile and said 'Gentlemen here is your Opera House'. The Queen opened the Opera House in 1973. The first production in the Opera Theatre was Prokofiev’s War and Peace and in the concert hall Beethoven’s Ninth Symphony. Today, more than 3,000 performances and events are held annually. The Opera Theatre seats only 1,547, it does not have a big stage or orchestra pit, but does offer an intimate atmosphere. The concert hall seats 2,690 under a vaulted roof for classical, jazz, folk and pop concerts. The 10,500 pip organ, designed and built by Ronal Sharp, is the world’s largest mechanical-action organ. The sumptuous Australian wood panelling and 18 acoustic rings above the stage reflect the sound. The Drama Theatre seats 550, the Playhouse 398. There is a Green Room, complete with bar, restaurant and lounge, five rehearsal studios, and 60 dressing rooms and suites. A trip to Sydney would certainly not be complete without visiting the Opera House. There are some fantastic tours which have been specifically designed to give you the full Opera House experience, and more information can be found on their website. We would particularly recommend to you 'Back Stage Tour' or go for the most popular 'The Essential Tour'. Of course you always have the option of going to one of the fantastic shows, concerts or displays that are regularly put on. More information can be found on their website but we also suggest you check our our Sydney Events Calendar to see what is going on when you are visiting.